It may be December but there is still plenty to look forward to in terms of Diver training. And some doesn’t even require to get cold and wet…. We gathered together at 8.30am on Sunday morning at the new club classroom to run an O2 course and review some Basic Life Support skills essential for 1st aid. Heaters on, Coffee brewed and candidates bright and enthusiastic, we knew it would be a good day. Lectures were broken up by plenty of demonstrations and hand on practical sessions including BLS (Rescue breaths and/or Chest compressions), using masks, putting casualties into recovery positions, examining casualties and making assessments to decide treatment, running scenarios, assembling and using various Oxygen kits and so on. In fact despite the cool winter temperatures, it was soon time to take the jumpers off as the rescue teams really got stuck into their drills. By mid afternoon the candidates were ready to run the whole show on their own, finding a casualty, assessing signs of danger, gauging their level of responsiveness and deciding if BLS and/or O2 might be appropriate. 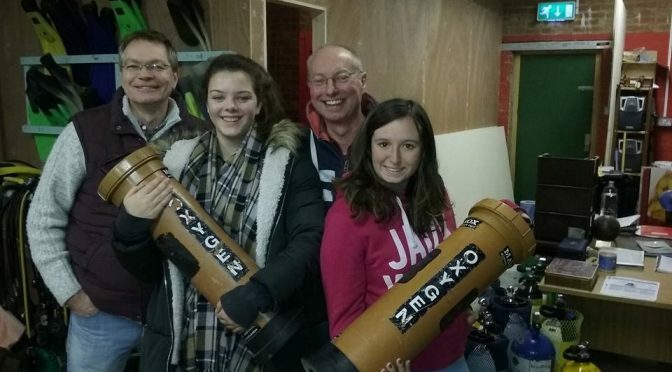 At that stage they very effectively worked as team members to do some 1st aid, assemble the O2 kits and administer oxygen while waiting for the emergency services they had already alerted. Observing the rising level of competence and confidence shown by the candidates throughout the day is a thrill to any instructor, so Helen, Andy and myself were delighted to see them achieve excellent scores on their final theory papers too. Well done and your qualification cards will be issued by BSAC HQ very soon. A bonus is that the O2 course covers a large chunk of the training required of Dive Leaders, so perfect for any Ocean or Sport diver looking at progressing up the grades. If you haven’t done this course yet, or would enjoy a refresher, speak to the branch and we look forward to setting a date for the next event. We will make sure Andy brings more of those awesome biscuits. Want to learn how to safely administer oxygen? This one-day course is designed to teach the administration of oxygen as a means on increasing the effectiveness of First Aid treatment of diving accidents. Oxygen treatment takes place on the surface – either on a boat or dry land. This course gives confidence to divers so they can assist with a diving-related injury cialis preisvergleich. The course concludes with a practical and theory assessment. Only those who pass the assessment will be able to apply for a qualification card.